Playing with toys is always the best way to do therapy, especially with little ones! Kids pay attention more and learn more easily when they are having fun. What better time to have fun than Halloween? Shoeboxes are so useful for making therapy materials! 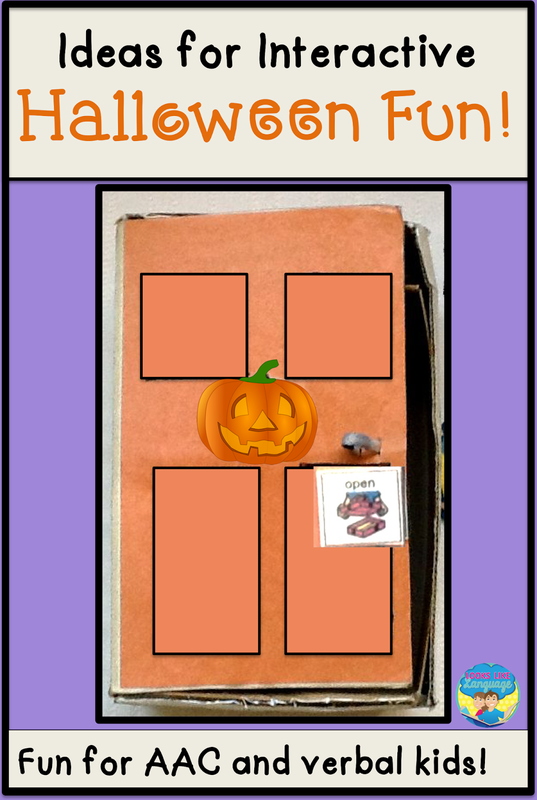 Glue on some construction paper, draw a door and some pumpkins, or just decorate it with some Halloween stickers. Then, punch a hole to tie some string into so you can open and close the door easily. 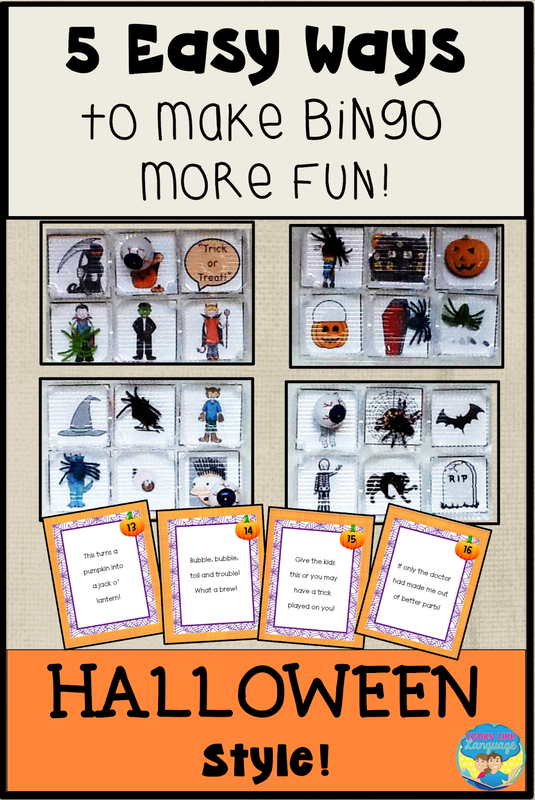 Look what a fun Halloween activity you have! There are so many reasons why it can be worthwhile to use your therapy time practicing Halloween routines. * Kids who don’t have the language will have a harder time participating with their peers. Keeping the language simple, in a repetitive routine, lets kids get lots of practice. 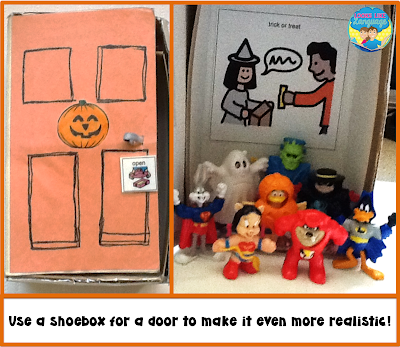 * Using shoebox props imitates the real routine and can easily support symbol use/exchange. * There are so many repetitive phrases and short sentences that you can use: Knock on the door. Open the door. Trick or treat. Thank you. Put it on. Take it off. Share with me! Put it in. Take it out. * Kids with motor speech problems benefit from the sing-song repetition and practicing the vowel change combination even if they can’t get the whole word. 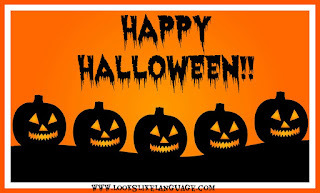 * For articulation errors, there are so many costumes and candies, you are sure to find something that will get them practicing their target sound. * For kids who get frightened by Halloween, learning the routine and playing with (a little bit scary) Halloween figures can reduce their fear. 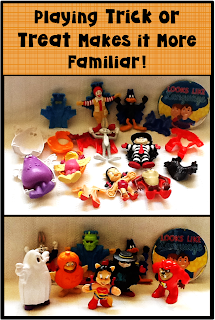 Some of you may recognize these toys from your childhood! They are a little bit scary but a whole lot safe. They are most likely difficult to find now, so just use whatever toys you have. 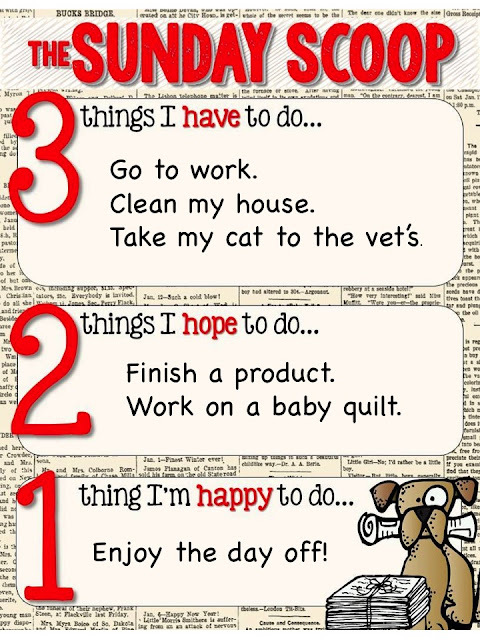 The important thing is to play the routine, model the language and have fun! Start by having a new friend inside the box every day. 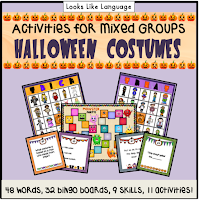 Introduce the name of the costume, find a book or activity that reinforced the use, and let the kids have a little free play with the toys at the end of the session. 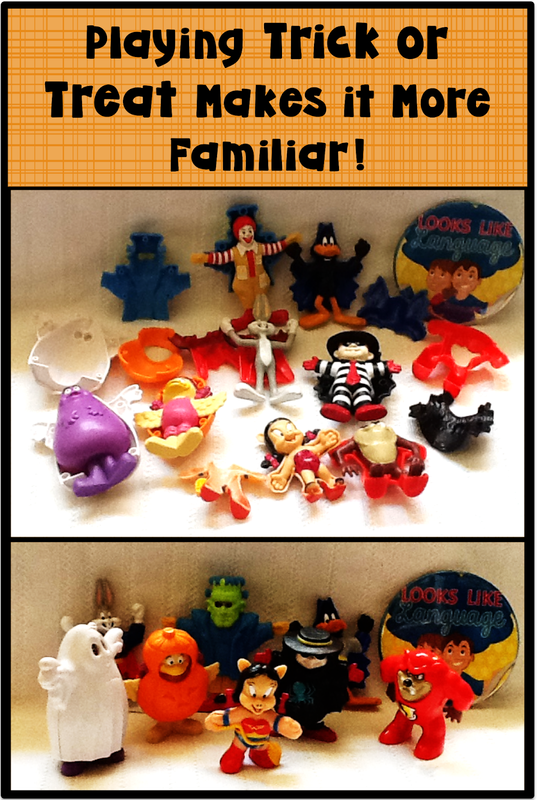 Toys where the costumes come on and off are certainly worth keeping your eyes peeled for when you are at garage sales! What toys do you like to use at Halloween? 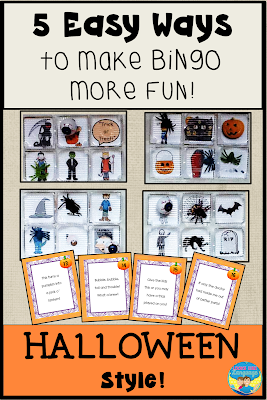 5 Easy Ways to Make Bingo More Fun at Halloween! 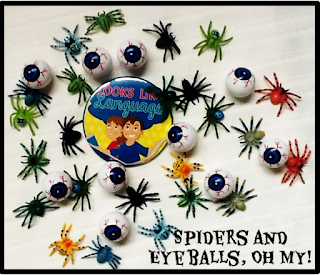 Spiders and spooky eyeballs! Oh, my! 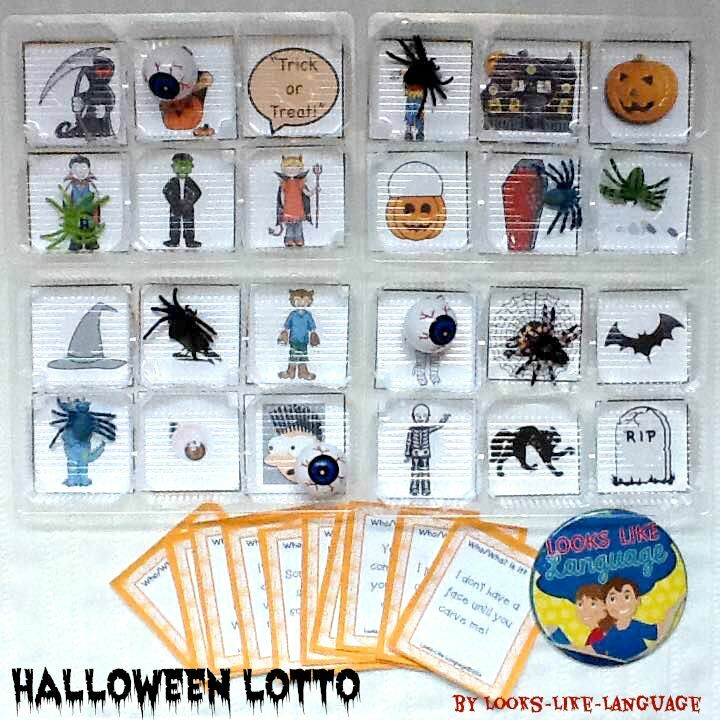 Halloween is such a fun holiday that even bingo can be made more fun this month! It is quick and easy to do and elicits more language from your students than traditional bingo. Combine the bingo game with questions, task cards, or descriptions and it is so easy to address goals! 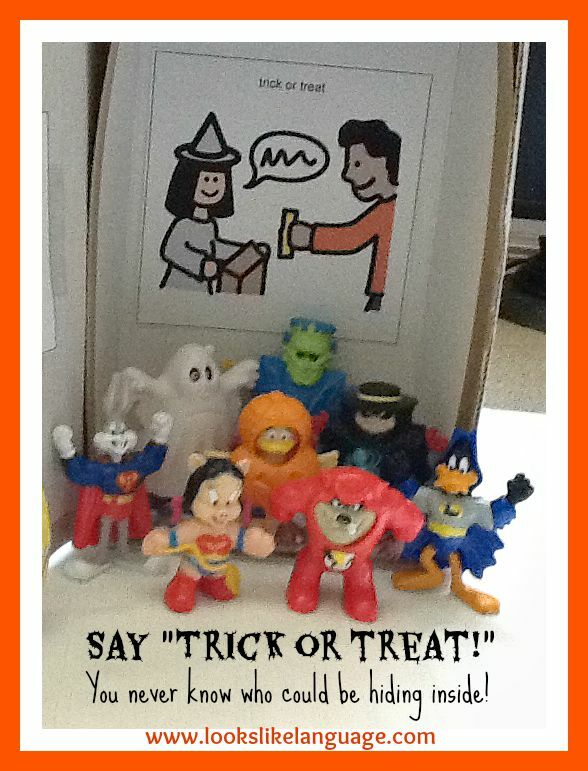 Tape any Halloween themed pictures that you like to the bottom of plastic containers with compartments. I used four empty ravioli plastic containers, but cookie containers are great, too. Then, get some really cool Halloween toys that are safe to toss for the game. I found some eyeballs and spiders to toss that my students like, but you can find cuter versions for younger kids. There are lots of variations for playing this game, but the way I’m playing this year is using inference cards. Read the inference card out loud and the first student to say the correct name gets to toss their Halloween spider or eyeball. * If they land on the target, their game marker stays there. * If not, their eyeball or spider gets removed and the next student gets a try. * Play continues until someone gets 3 in a row. * If time runs out first, the student with the most items tossed in the game is the winner. Rapid naming race: Students start their Halloween toy in a corner of the board and have to move across the rows (or up and down the columns) to get to the other side to win. 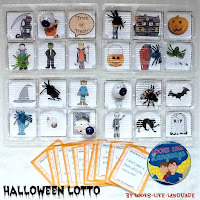 According to their needs, they have to rapidly name (the Halloween item, a describing word for the pictured item, an associated item, etc) for each square within the time limit. When they take too long or get blocked, they stop and it is the next person’s turn. Individual No-Toss Play: Separate the picture boards and the associated inference cards so that each student has their own. Place their inference cards in a pile in front of them. Students take turns reading the cards and making an inference, covering the picture if they are correct. If incorrect, place the inference card back on the bottom of the pile to replay. The first student to fill their game board wins. 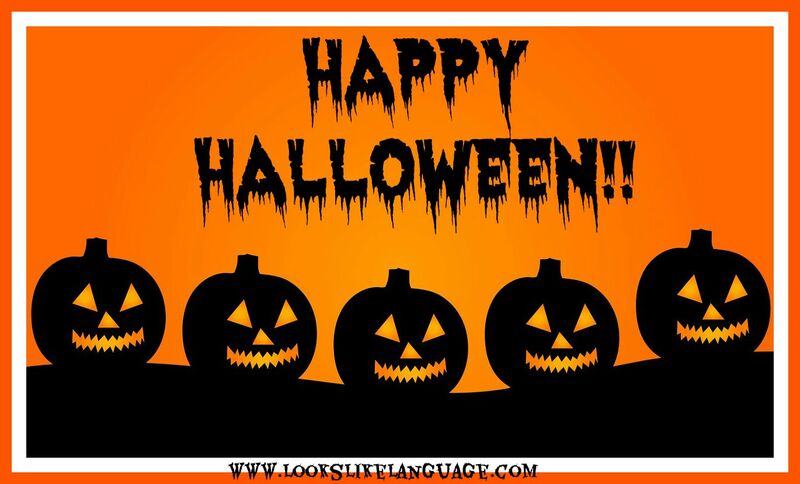 Use Your Language: Have the students toss first and then correctly define, describe, or use the vocabulary in a sentence in order to keep their Halloween item in the game. Play ‘Bump’: Have the students provide whatever their typical target is before tossing. All tossed Halloween items stay wherever they land unless someone lands on top of them. Then they get bumped back to the student. The first person to get the designated number in a row wins. 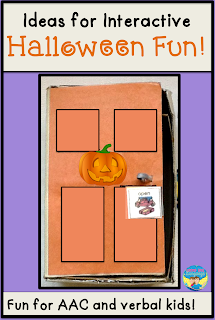 I use this game idea for Halloween, but if your students love it, you can change out the vocabulary and play it for any holiday! Don't have time to find all those pictures yourself? Believe me, I know how time consuming it can be! Then click here to check out a detailed preview for Halloween Costumes. There are so many activities included! 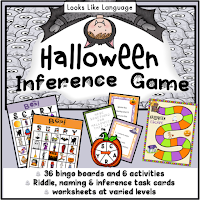 If you want even more activities to make your mixed groups easier, also take a peek at the Halloween Inference Game. Did you know? 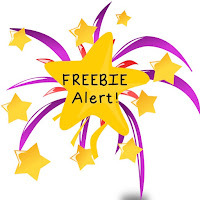 When you get the bundle, you get a freebie as well as as a discount! I hope you are having a spooktacular time leading in to Halloween! Thanks to The Frenzied SLPs for the invite to link up. 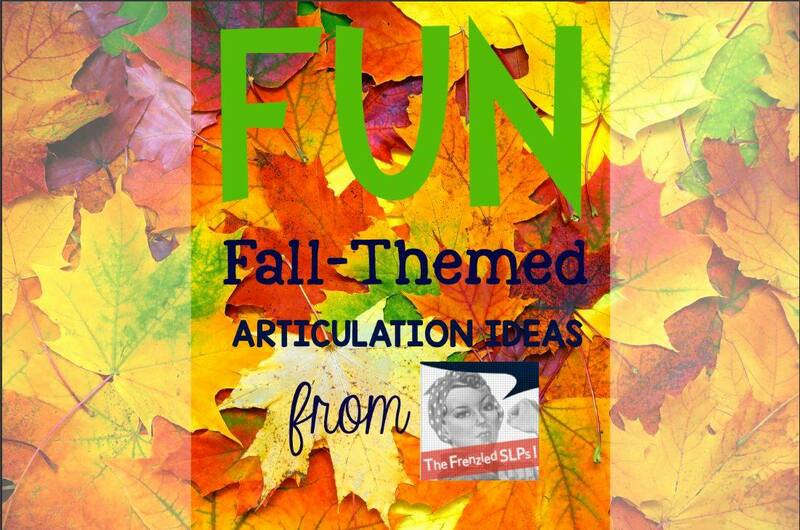 I can't wait to see all the fun ideas being shared! 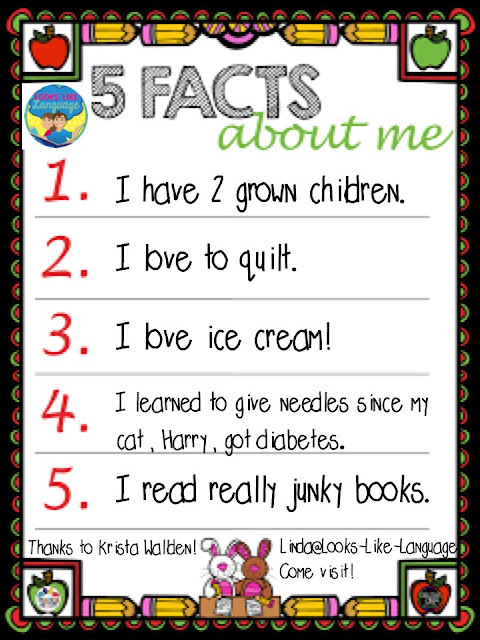 They have link ups with great ideas for SLPs twice a month, so be sure to check back in often! Let’s face it, we like to think of fall only with crisp, clear, sunny days and beautifully colored leaves, but that isn’t the only fall weather! Fall has rainy days, too, so what better time to practice ‘”R” sounds, as most SLPs have at least one "R" student on their caseload! I like to practice getting the initial “R” sound in words by pairing it with an “R” vowel. I seem to have the most success with getting production of “er,’ but please use whatever your student has achieved. 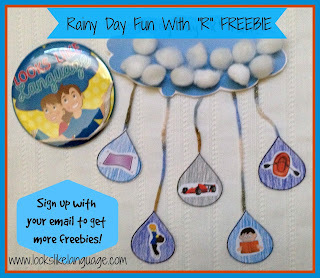 Use the templates provided to have a fun rainy day craftivity by drawing or gluing “R” pictures on the raindrops. To make the language more functional (and get more productions) I explain that we are going to pretend to have a hard time making up our minds which picture we want. The students need to roll a die, or spin a spinner, to see how many times they change their minds. Supposing they roll or spin a 3, their turn would sound like this. The other students need to listen and tap the picture on the table when they hear the word without the “er.” To move it up a notch, have the students tap the picture only if the “R” sound is said correctly. If the last “r” sound was said correctly, the student gets that picture to glue on the raindrop. If not, the picture stays on the table and the next student gets a turn. If you have students in the group who are working on other sounds, just add pictures for their target sounds and try another hesitation word, such as gosh, well, or perhaps. cute craft at the end! For more fun fall articulation activities, don't forget to link back up with The Frenzied SLPs! Sign up with your email on the top right to get FREEBIES that aren’t posted in my store. You can get the template/homework follow up for this craftivity here. If you like using co-articulation or paired sounds in therapy, stay tuned for a more in-depth post on how I use this technique coming soon! One of the wonderful aspects of being on TpT is the lovely people you get to meet. We are all over the world, working hard to help make children's lives a little better, one skill at a time. 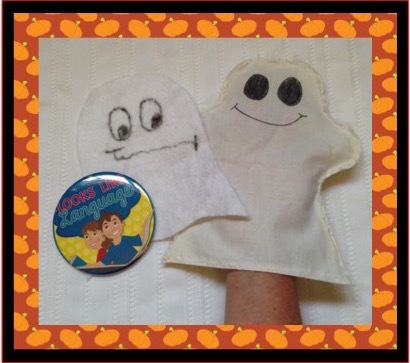 I want to thank Nikki, from Teaching Autism in the UK, for inviting me to share in this fun linky. I really enjoyed finding out more about her and thought that maybe you would like to get to know me a little more, too! I'm so much better at writing about therapy ideas than I am about myself! These facts seem pretty self-explanatory as well. But, feel free to ask me questions if any of this interests you! I'd love to chat! Thanks to Krista Wallden at Creative Clips for the font and graphics. Would you ever want to see photos of my quilts? What's your hobby? 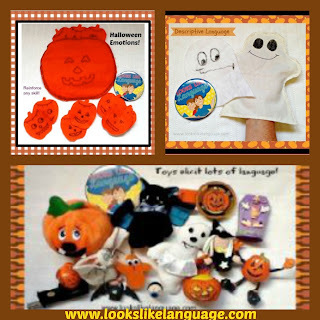 3 Fun Free Speech/Language Therapy Ideas for Halloween! Halloween fun doesn’t have to be expensive if you are working with littles. 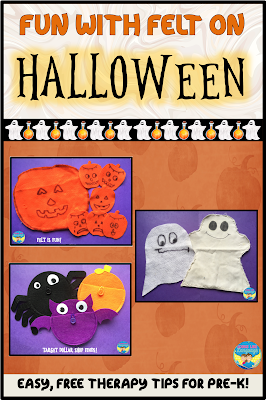 The three engaging ideas featured here are easy to do and only require basic supplies, like felt, tape and markers. Give it a try! Preschoolers love to find hidden things! 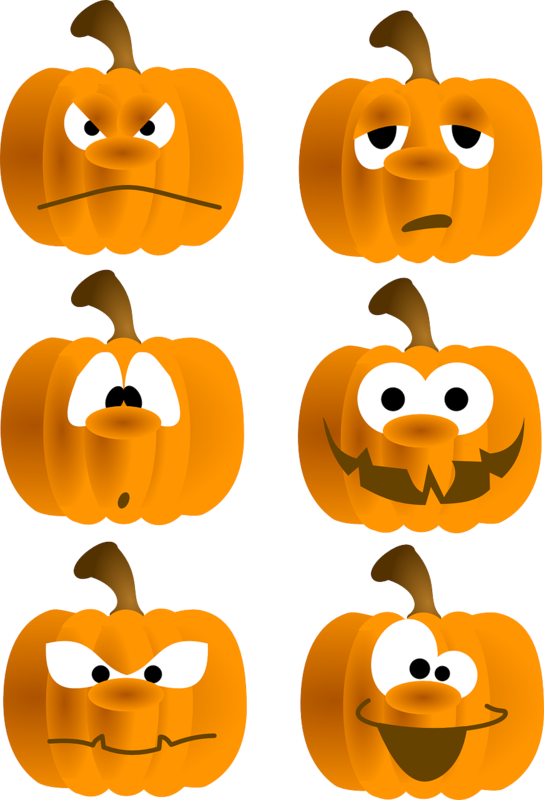 Hide small pumpkins with varied emotions faces are hidden inside the big pumpkin bag. After their targeted speech or language target was elicited, students picked a pumpkin out of the bag. One thing that is great about using felt is that the littles have something safe to hold onto and play with while waiting their turn! Little ones will have fun just playing the game, but you can make duplicates of the emotion pumpkins to play and see who gets the most matches. Felt is also such an inexpensive, versatile way to make your own therapy materials! 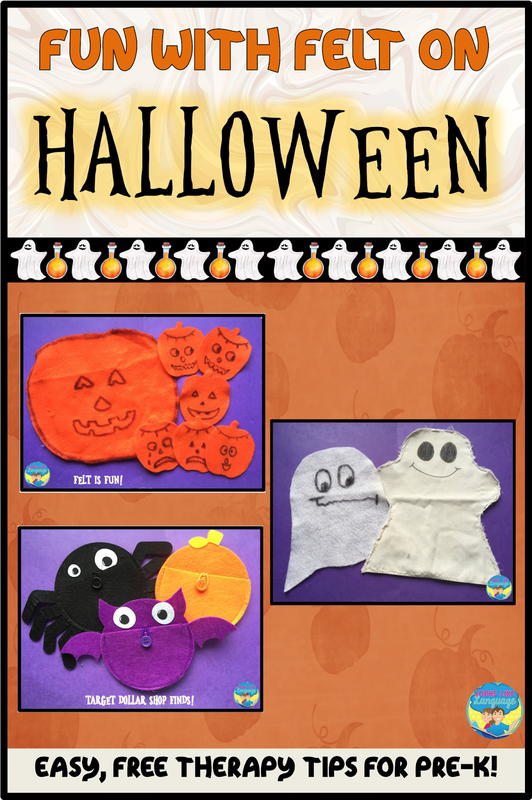 With every color available, you can make simple felt shapes to match every holiday and season. All it takes is the right color felt, a marker, a simple shape you can draw (believe me, I’m no artist!) and a glue gun to keep it closed. In a hurry? Staple the sides together and put some scotch tape over the staple backs if you have concerns about pricking little fingers. Get a piece of felt that is double the size of the shape. 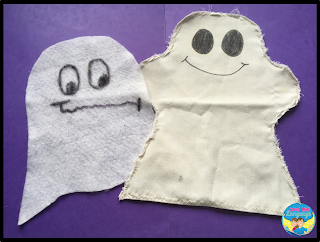 Draw the shape with the permanent marker, fold the felt in half and cut around the shape you drew. Glue gun (or staple- tape doesn’t hold) the sides together and voila! You have a cute little felt bag to hide things in, or a puppet. When there are no issues of tactile defensiveness, little ones love to find whatever is hiding inside the bag. It’s kind of like getting a present! For kids with sensory issues, I’ve found it helpful to show them what is inside and then just place the bag on the table. 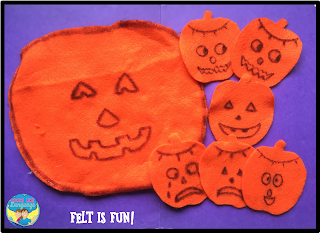 Felt is a soft, familiar material and many kids will explore it on their own when they are totally in charge of the pace. For kids who still have issues, try making a mini version that you leave on the table in front of them and just let them peek or participate in whatever way they can handle until the activity is familiar. • putting pictures of varied Halloween vocabulary inside to be talked about after being picked. • You can also use the bag for a fun listening activity. 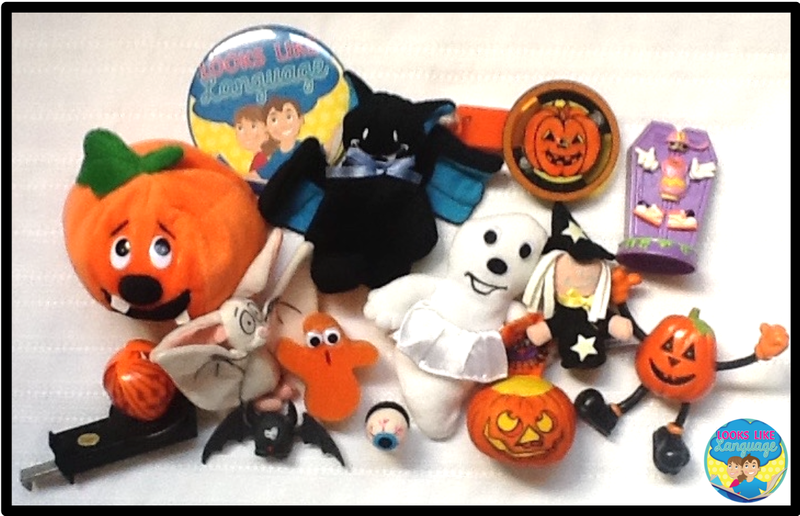 Describe one of the picture cards you used that session to elicit speech/ language goals and see who can find the correct picture first to put in the pumpkin bag. Therapy and clean up all in one! Here are some examples of the types of toys that could be used, but don’t put them all in at once. Add a new toy, maybe every other session or so. 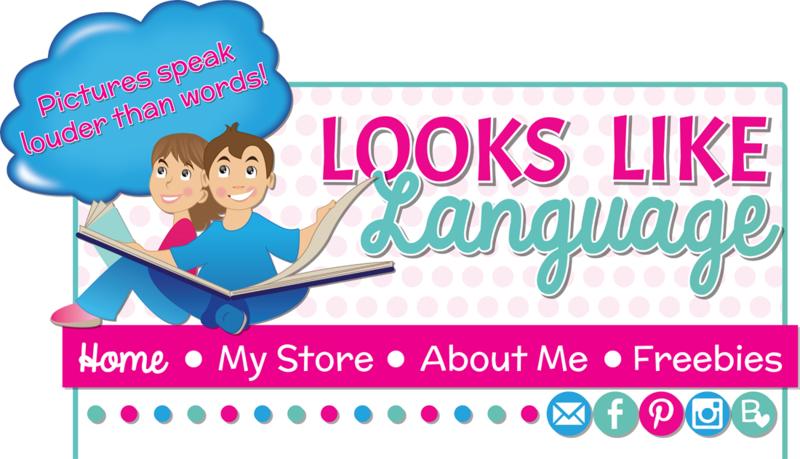 You will see when your little ones get the language you’ve been modeling or start losing interest. After they have explored the new toy, bring out the non-familiar ones for a little describing and comparing/contrasting. Did you notice there’s a variety of colors and textures there? Did I say compare and contrast? You’ll notice there are two ghosts there. One works as a puppet and one doesn’t. One is small and one is big. One is fuzzy (felt) and one is smooth (fabric.) One is happy and one is sad. Puppets are such a great therapy tool for little ones! They let you adopt another voice, play little games like giving and taking a toy, or tickling in a way that is so much safer than interacting with a new adult. I love crafting therapy materials! Did I manage to convince you that you can do this, too? 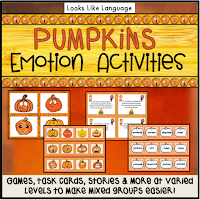 If you don’t enjoy making materials, don’t have the time, or work with older students, take a look at my Halloween Emotions Game. Also lots of fun and there are emotions in this packet that I could never draw! My weekly posts with SLP tips will be arriving on Tuesdays this month. 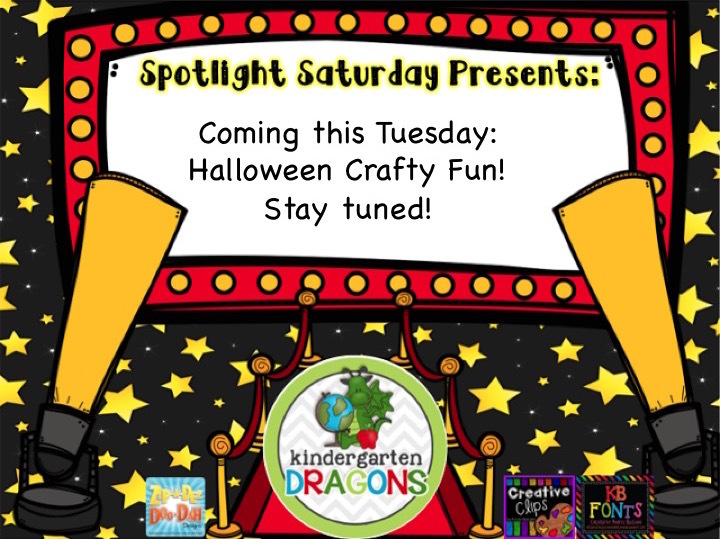 Stay tuned for fun Halloween activities and a new freebie this month! 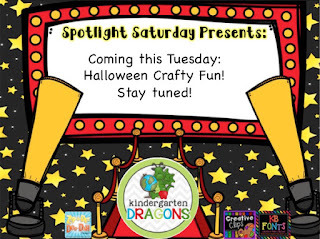 I'm joining up with Erin at Kindergarten Dragons for a last minute Spotlight Saturday post! Those of you with little ones know that they can show a variety of emotions on Halloween. Stay tuned for my Tuesday post for some crafty ideas for an emotion game that is lots of fun! Here's a sneak peek! Hope your Saturday was great!